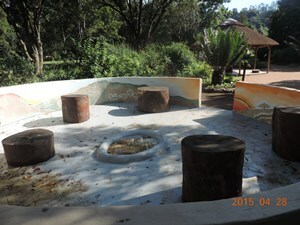 The Zulu Pharmacy – Plants used in traditional medicine, health and beauty. These useful plants have various culinary, medicinal and cultural uses. Some plants treat headaches, snakebites etc. Over a thousand different plants are used in Zulu culture for medicinal purposes alone. Many of these plants are becoming threatened due to over-harvesting of wild populations. This exciting garden aims to broaden public awareness on the importance and value of our useful plants. 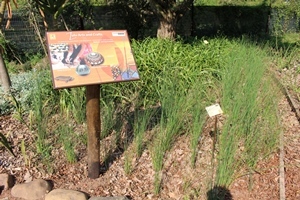 Zulu Arts and Crafts – Plants used for building, weaving and textiles. 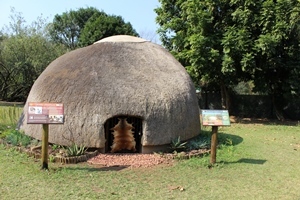 This section aims at educating the public about the means that the Zulu people have implemented in the past to earn their living and still do today in some parts of northern Zululand. Zulu Magic and Charms – Plants with spiritual significance in Zulu culture and folklore. Most Zulu homesteads are protected by plants from lightning and witchcraft. 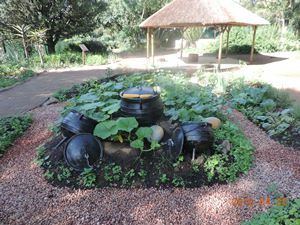 The Zulu kitchen garden – Food plants that are either planted around the homestead or harvested directly from the wild as required. 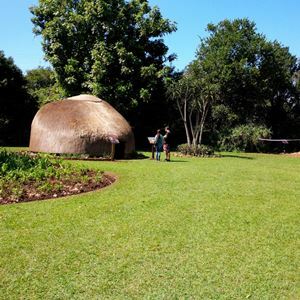 It is said that no one ever went to bed hungry in an old Zulu society, and this was due to their skills of farming, using what is called permaculture today. Bartering was a trading method used to share all sorts of crops and ensure that everyone had food. This section aims to educate the public about getting back to basics and producing their own food. 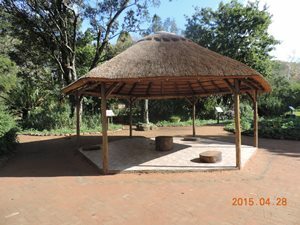 This garden also teaches visitors about rituals, ceremonies, songs and music, dances, storytelling and clothing associated with Zulu culture. Storyboards are used to interpret aspects of Zulu culture. Through interpretation visitors will learn more about the fascinating traditional culture, society, history and beliefs of the Zulu people – one of the most significant and influential tribal groups in South Africa. Discover how Zulu spirituality and religion influences their unique ceremonies, rituals, music, songs and dances; and how the indigenous plants of KwaZulu-Natal form part of their everyday lives. Gain insight into how the oral tradition of Zulu storytelling and use of lore, proverb helps consecutive Zulu generations in understanding and interpreting the natural world of plants and animals. Look at displays of cultural weapons, woven baskets, mats, clay pots, utensils, bead work and musical instruments inside the traditional beehive hut. To book cultural tours and other cultural events please contact Mbuso Zondi (Interpretation Officer) or Siphu Ngqasa (Marketing Officer) on +27 (0)33 344 3585.